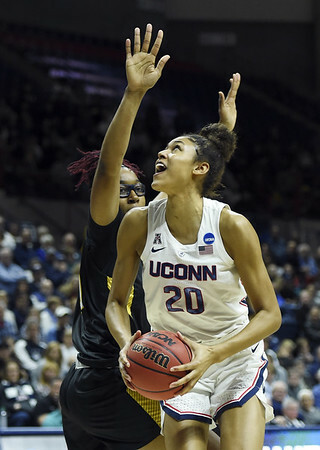 TAMPA, Fla. - Geno Auriemma glanced at Olivia Nelson-Ododa’s line in the box score from his UConn women’s basketball team’s win over Louisville Sunday and read no points and no rebounds. But the Hall of Fame coach saw something from his freshman sixth man - actually quite a bit. It was similar to what Auriemma said in December when Nelson-Ododa gave him productive minutes in a win over Notre Dame. And it’s what he’ll need to see again Friday night if the Huskies are to repeat their success from four months ago against the Irish when the teams meet in an NCAA Final Four semifinal at Amalie Arena. Nelson-Ododa is averaging 4.4 points, 3.8 rebounds, and 1.4 blocked shots (fourth in the AAC in 14 minutes over 37 games for the Huskies (35-2). In her four starts in place of injured senior Katie Lou Samuelson last month, including three in UConn’s run to the AAC tournament title, she averaged 7.5 points, 9.3 rebounds, and 2.0 blocked shots. The Winder, Georgia, native had two stints off the bench Sunday, playing the last 1:24 of the first half after Samuelson picked up her second foul, and a 6:35 stretch of the second half after Samuelson was called for her fourth foul. The Huskies added two points to their lead to end the first half. When Nelson-Ododa came on with 2:56 to go in the third quarter the lead was nine and when she went out with 6:21 remaining the advantage was seven. The break probably did Samuelson a lot of good. After the Cardinals cut it to four, Samuelson scored all the points in an 8-1 run in a 2:46 span to give the Huskies some breathing room that they would need down the stretch to hold off a Louisville charge. While UConn is making its 12th straight Final Four appearance and 20th overall, both NCAA records, it’s the first for Nelson-Ododa and classmate Christyn Williams. In the 89-71 win over Notre Dame in South Bend on Dec. 2, Nelson-Ododa played 16 minutes and had five points, five rebounds, and a loud block on a drive by guard Marina Mabrey that had the Irish senior whining for a foul and that led to a transition basket for Williams. With Notre Dame’s imposing size on its front line in standouts Jessica Shepard and Brianna Turner, UConn hopes Nelson-Ododa can be a factor a second time around. Posted in Newington Town Crier, UConn on Thursday, 4 April 2019 21:18. Updated: Thursday, 4 April 2019 21:21.